~The National Corvette Museum offers Museum delivery to help you truly experience and enjoy your 2019 Corvette. This program is designed to help you get the most out of the Corvetting hobby! Referred to as OPTION “R8C” and available through Mike Furman at Criswell Chevrolet (301-212-4420) when specified during ordering, R8C customers are welcomed with signs and a guided V.I.P. tour of the Museum where their new Corvette is displayed, followed by an orientation and presentation of their new 2019 Corvette. The customer receives a one-year subscription to the NCM magazine, a unique gold decal on the inside of the driver’s door jamb, and a commemorative wall plaque (with the customer’s name, date of delivery and VIN) is ordered. You can also have your friends and family watch on the Boulevard Webcam as you spend your special day at the Museum taking delivery of your custom built Factory ordered Corvette. I am a Lifetime member of the Corvette Museum and I am also my local Corvette Club's Ambassador for the Corvette Museum. So the Museum really rolls out the Red Carpet for all my Corvette customers. 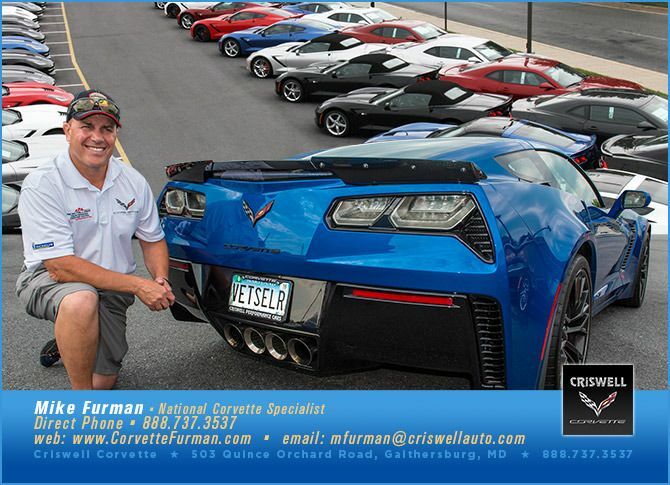 Place your phone call to my desk direct line 301 212 4420 or email mfurman@criswellauto.com and let me explain how seamless the whole process is. You will never have to step foot inside the dealership. I deal in high volume not high profit. I am now in my 41st year selling Corvettes and this past Spring delivered my 4,000th Corvette! *Since 1953 the Corvette has been America’s Sports Car. The National Corvette Museum was established as a 501(c)3 not-for-profit foundation with a mission of celebrating the invention of the Corvette; preserving its past, present and future; and educating the public about Corvette. The Museum opened in 1994 and is a 115,000 square foot facility located on a 55 acre campus. Bowling Green, Kentucky is home to the world’s only General Motors Corvette Assembly Plant. The National Corvette Museum is conveniently located off Interstate 65 in South Central Kentucky. Less than one hour north of Nashville, TN and less than two hours south of Louisville, KY, the Museum is a quick and easy stopover if traveling by car, or a quick drive from the airport of your choice. Located in the Central Time Zone. Very good and complete description of the NCM Delivery Process. I’d like to add that the NCM PDI personnel, unlike any other Chevrolet Dealership, only prepare for delivery Corvettes. No; Silverados, Camaro, Volt/Bolts, Tahoes, Equinox’s, Cruise’s, etc. Only Corvettes, what more could you ask? And then as a bonus, each person envolved in the PDI affixes his/her signature to the underbody of the delivery. Wow, how cool! I would, personally highly recommend checking that “R8C” box. I know I will the next time! Not to sound ignorant but what does 2020 deal folders mean or involve..? I believe the folders are deals/deposits he takes for future orders when they become available, based on dates, so he can give priority. Mike, how many do you have for the C8, 100, 1000? 66 that month, 61 were the new 2014 Corvette Stingray. One of my favorite sayings "Chance favors the prepared mind!" I have a new thread that will be coming out tomorrow (Feb 1st) that specifically adds to how Mike’s process works so well.